Some foreign observers of the Chinese economy have raised doubts over China's 6.9 percent GDP growth for 2015, given the sharp drop in domestic demand indicated by the 13.2 percent year-on-year decline in imports in yuan-denominated terms. But GDP statistics cover a wide range of economic indicators, so the overall economic situation cannot be reflected by one or two factors. The sharp decline in the value of China's imports is related to the composition of imports. Commodities represent a large portion of China's imports, and since prices of commodities such as iron ore and crude oil decreased by more than 20 percent in 2015, a big drop in the value of imports would occur even if the quantity of imports was the same. Instead of debating GDP data, we should pay more attention to the situation for the three key economic drivers: investment, consumption and exports. The biggest difference structurally between China's GDP and that of other countries is that China's gross capital formation, also known as gross domestic investment, has hitherto accounted for too big a proportion of the country's GDP. In other words, China's GDP growth has relied too much on investment. Between 2001 and 2015, China's annual fixed-assets investment growth averaged 22 percent, while GDP growth during the same period averaged around 9 percent. 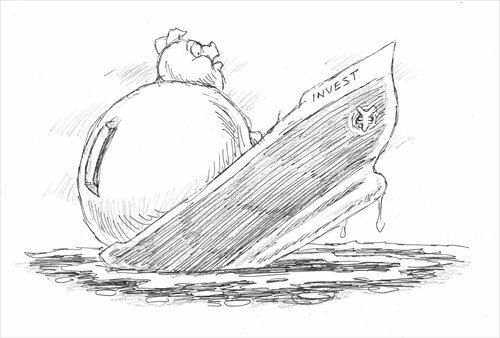 Three reasons have contributed to China's unsatisfactory investment efficiency. First, investment has been government-led rather than market-oriented, which has hindered the market's deciding role in allocating resources. Second, amid China's regional development strategies in West, Northeast and Central China, the direction of capital flows deviated from that of flows of population, leading to mismatching of factors of production, and consequently low investment efficiency. Third, State-owned enterprises (SOEs) have easier access to credit, which can exacerbate overcapacity and increase leverage. Regarding consumption, its contribution to China's GDP is still much lower than in developed countries. Meanwhile, a certain degree of distortion persists in China's consumption, which is highly related to Chinese people's income structure. Despite the fact that China is the world's largest market for luxury goods, the country still faces the problem of insufficient effective demand. The reason for this is that the income disparity between the rich and poor is too big, and China has too small a middle class. Official statistics have shown that even though the income gap between China's urban and rural areas has narrowed, the gap among urban citizens is widening. Exports, the third key economic driver, declined by 1.8 percent in 2015, far below the growth target of around 6 percent mentioned in China's 2015 government work report. The big discrepancy reflects weak demand in the global economy, and reduced advantages for China's exports. The prospects for future exports are not optimistic, because China is confronted with pressure from three aspects. The first is increased domestic labor costs, which has led some domestic manufacturers to relocate to Southeast Asian nations that offer cheaper labor. The second is that depreciation in the yuan is expected to be limited. Even though the yuan is no longer appreciating against the dollar, the yuan's real effective exchange rate is still strengthening, given the fact that other foreign currencies are depreciating. The third is the negative effect on China's exports brought by Germany's re-industrialization. China's manufacturing also faces some comparatively high costs in areas such as electricity and logistics. Following the wider use of robots in Western countries like the US and Germany, manufacturing costs are expected to be further lowered. So China's exports face a range of challenges, not only from developed countries, but also from developing ones. It's hard to draw a positive conclusion after analyzing these three economic drivers. Even though China is the world's largest manufacturer, the country is not competitive enough, and has invested a relatively small amount in facilities and R&D. Meanwhile, China's advantage in exports that used to be based on cheap labor has developed into a disadvantage. Consumption could have been the biggest driver for boosting growth in China, but this has been hindered by blindly chasing high growth and high investment. The distorted income structure has also hampered the contribution to GDP from consumption. A country's economy is characterized by its various systems. If relevant reforms are not pushed forward, the results may not turn out to be positive.